Commonwealth Cup runner-up bounces back to form for Richard Fahey and Paul Hanagan. Sands Of Mali bounced back to form with a bang to spring a 28/1 surprise in the QIPCO British Champions Sprint. The Richard Fahey-trained three-year-old colt had been in good form earlier this summer, and was beaten just half a length in the Commonwealth Cup at Royal Ascot, but his form since had been below that level. He rediscovered his mojo, making all under Paul Hanagan to beat Harry Angel (4/1) and Donjuan Triumphant (16/1) by a length and one and a quarter lengths. Yorkshire-based Fahey said: “It’s been very frustrating – he just got nailed at the Royal Meeting and things went pear-shaped after that. He’s always worked like a nice horse at home, and today he’s proven that he is. He’s had a couple of goes [at Group One races] and today it’s come good so I’m delighted. A delighted Hanagan said: “I quite enjoyed that! We’ve always thought a lot of Sands Of Mali and today he showed everyone what we’ve always believed. 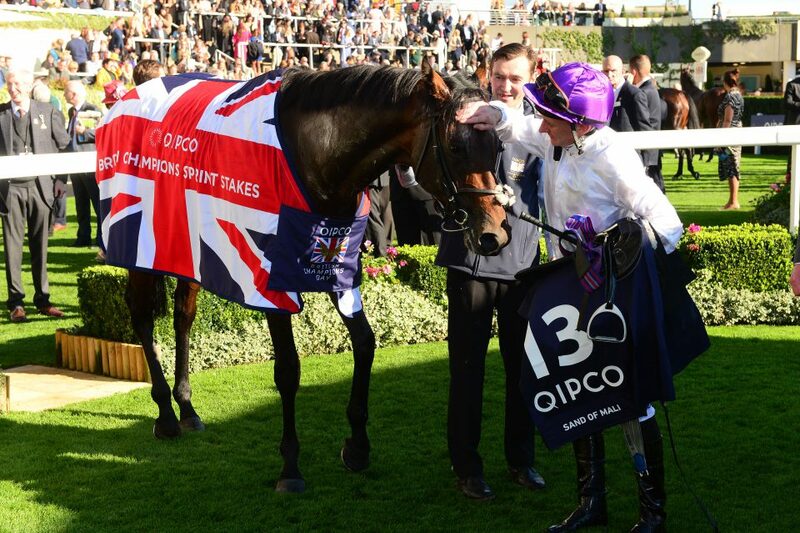 “I was never headed and I couldn’t believe how well I was going with two furlongs to go. I just loved the way he picked up again when Harry Angel came to challenge him. Both trainer Clive Cox and jockey Adam Kirby declared themselves “very proud” of Harry Angel, second in the £632,500 G1 QIPCO British Champions Sprint Stakes. Kirby said: “Of course I’m proud of him – he’s a superstar, isn’t he? It’s a shame to get beat but nice to end things on a high. He’s been a great horse. The ground here just blunts his gear-change, so I feel a bit sorry for him. “Harry Angel probably gets a little bit claustrophobic in the stalls, but one thing I will say is well done to Clive Cox and all involved with the horse. They have always done a remarkable job with him – not only do you have to train a champion but you also have to train his mind as well. “It has not been an easy run for Clive. He is a great guy to deal with and fair play to him. I am just a little gutted that the horse was beaten – I think he would have taken them apart if the ground was livelier. It was a bit of a bog out there and the last furlong is exceptionally slow. Brando finished an honourable fourth on his third appearance in the race. Sent off the 3/1 favourite, The Tin Man, ridden by Oisin Murphy and trained by James Fanshawe, came home in seventh.